When road conditions get tough, you want a tire that will that is going to perform and get you where you need to be. The Bridgestone Dueler A/T Revo 2 not only does this, but it does it at the top of its class. Bridgestone has used its advanced tire technology to come up with a world class tire to handle all types of terrains and weather conditions. When you look at the tire you will see that the tread design is well balanced with a symmetrical tread pattern. The result is a tread design that is well balanced and delivers better performance and a more quiet and comfortable ride. Bridgestone has used its Dual Layer Tread Technology to ensure wet traction even while the tread wears with the help of a higher grip rubber. It also utilizes its latest Dura Tech tread compound, which ensures a longer tread life by minimizing tearing or chipping of the tread on rough surfaces. Handling with Bridgestone Dueler A/T Revo 2 is excellent due to the use of a semi stealth blocks with a circumferential center rib. The off-road capabilities of this tire are equally as impressive due in part to intermediate tread blocks and more shoulder stability. When it comes to handling and traction on wet road surfaces, the Dueler A/T Revo 2 excels. Added circumferential grooves combine with lateral grooves to flush more water out from under the tread surface. What may surprise many drivers is the ability of this tire to handle rough winter weather conditions. You’ll find excellent traction in moderate to heavy snow, as well as on ice, due to unique stepped inside notch and saw tooth grooves. Inside of tire you’ll find two strong steel belts that are reinforced with spirally wrapped nylon for additional strength. Bridgestone has also added something known as O-Beads, which further improves handling and provides increased tread life. 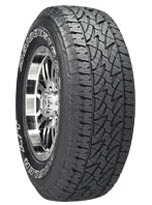 Overall, the Bridgestone Dueler A/T Revo 2 Tire is one of the best all-terrain, all-season tires on the market today. The grip is excellent and ride comfort is superior. Prices for the Bridgestone Dueler A/T Revo 2 Tire range from around $158 for the 15 inch series tire to approximately $320 for the 20 inch series tire. If we have a valid Bridgestone tires coupon it will be shown below the text. You can find other reviews and coupons for tires here. Who Are Bridgestone Dueler A/T Revo 2 Tires Designed For? Bridgestone’s Dueler A/T Revo 2 tire is designed for drivers of SUVs, light trucks and crossovers who are seeking a tire for all terrains and year round traction on dry, wet and snow covered roads. Bridgestone Tires covers the Dueler A/T Revo 2 with a 5 year or 50,000 mile tread warranty, except on LT tires. Tire uniformity is guaranteed for the first 1/32 inch of tread wear. Materials and workmanship are backed for 5 years and call for free tire replacement during the first 3 years. This is followed by a prorated amount for the remaining time period or until the final 2/32 inch of useable tread is left on the tire. You’ll also find Bridgestone’s 30-day buy it and try it guarantee that allows you to refund or exchange the tires in the event you are not satisfied.